COURSE: The Gobbler Grind 5K is semi-flat and runs on the paved trails of Corporate Woods. It’s a USATF Certified Course (#KS14049KH). *save money by registering 4 or more! 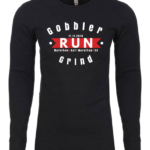 All 5K participants will receive: A Gobbler Grind long-sleeved wicking thermal running shirt, a finisher medal, post-race refreshments, chip timing, free race photos, and discounts/giveaways from our sponsors! The race will be timed using bib timing chip technology. Participants can opt-in to receive live tracking and updates to post to Facebook, Twitter, or SMS Text Message when they register for the race. Sign up for live tracking HERE. Live Results featuring video and photos will be posted HERE after the race. The Awards Tent will be located in the Finish Line Festival area next to the Results Tent. If you placed in the top 3 overall or in your age group come to the Awards Tent to claim your award. If you need to leave before awards are announced, we are happy to give you the award early. Friends may also pick up awards for you. Any awards not claimed at the race can be picked up starting the Tuesday after the race at the RaceDay Events office, 208 W 79th St, KCMO, 64114. Email us at info@resultskc.com before you stop by. No refunds will be given for the event. You may switch to the Virtual Race option or transfer your registration to another person. We will run in rain, cold, or snow. If there is thunder or lightening, the race may be delayed until it passes. If the race is canceled in the event of unsafe weather or other unforeseen conditions, no refunds will be given. You must notify us prior to race day to make any changes or transfers.